Monday, April 20, 2015 marks the 119th Boston Marathon. 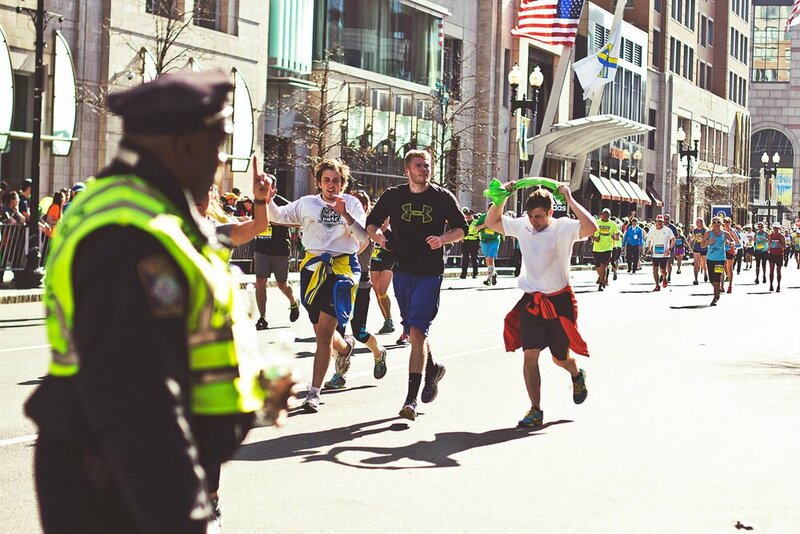 After seven Emerson students were injured in the 2013 marathon bombing, many Emersonians plan to participate in this year’s event. For some, it will be the first time, while others will run for the second or even third year in a row. Overall, 30,000 runners are expected to participate in the marathon this Patriot’s Day. Additionally, it is predicted that about one million people will come watch the race. The Boston Marathon is the world’s oldest annual marathon, and is an esteemed road racing event. The historic course starts in the town of Hopkinton, Massachusetts, and the finish line is located on Boylston Street, near the John Hancock Tower in Copley Square. At just over 26 miles, finishing the race is not an easy feat. Matt Lavallee ‘17 has always wanted to complete the marathon. Though he runs cross-country at Emerson, he has never run a race of this length before. Lavallee, who considers himself a decent runner, has not yet run 20 consecutive miles, but has gotten close. “I’m not trying to be competitive,” says Lavallee. “My only goal is to be able to say I did it, [to] prove something to myself, and be a part of this tradition.” Like many Emerson students from the area, Lavallee has watched the race in previous years. He was very close to the bombing and feels a strong connection to the marathon. Tyler Breen ‘17 and Logan Reever ‘17, brothers of Emerson’s Phi Alpha Tau fraternity, will be running this year as well. Reever has set a personal goal of running the marathon all four years he is at Emerson, and this will be his second year participating. He hopes to finish this year next to his brother, who is coming up from Florida to run alongside Reever. “To anyone considering running it, I would say it’s something you'll have with you forever. It’s such an amazing accomplishment [and] the sense of euphoria you get after it, besides the surreal amount of soreness, is unmatched with any other feeling,” says Reever. Their previous experience and training regimens may vary, but all three boys have similar goals and reasons for running. Above all, they share an intense amount of pride and love for the city of Boston and the tradition of the Boston Marathon. “It’s an amazing day and the support you get from the people who love you and the people of Boston and all of Massachusetts cheering you on along the way is just unfathomable. It may…be scary in the beginning, but it’s so very much worth it,” says Reever. Breen, who grew up in New England, has always watched the marathon at school or with family, and was able to watch it in Boston as a freshman at Emerson last year. Running it himself has been something Breen has wanted to do for a long time, and a few of his fraternity brothers convinced him to participate this year. He ran cross-country for seven years in middle and high school, and was captain his senior year. Breen has been training by doing 10 to 20 mile runs on the weekends and occasionally on weekdays. “I’ve run too many races to keep track of and running is one of my favorite things to do,” says Breen. Although he has never run a marathon before, he hopes to complete the race without walking and enjoy the experience as much as possible. Breen feels that everyone should run a marathon at least once in his or her life. Reever has a personal connection to the marathon; his dad ran multiple times throughout his life when he was working in Boston and even placed 81st one year. Though Reever doesn’t usually run, he always tries to strive for something that seems far from his reach. Doing the impossible “keeps me going every day” and he likes “to have something to work towards.” Reever has been running five to 10 miles a few days each week in order to prepare for the race.